in 2009 and the report written below applies specifically to that trip. 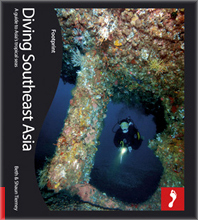 Times change... since we first wrote about Dive Damai, much has changed. The Company has expanded and now has two ships. Damai 1 has been reconfigured so many of the minor details listed here no longer apply, however, the service and standards are as good as always. Damai 2 is slightly larger than her sister but very similar. These ships merge traditional values with modern standards. Please refer to their website for accurate information. 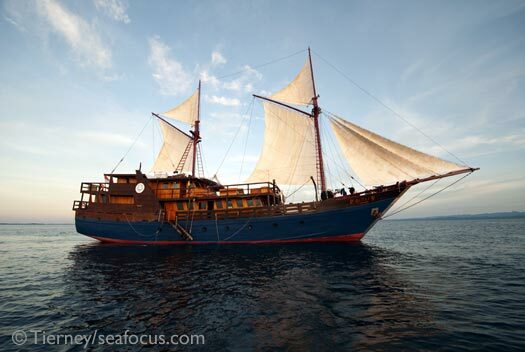 The brainchild of Spanish divemaster, cruise director and Indonesian diving veteran, Alberto Reija, Damai is a brand new Phinisi schooner that was designed to be the ultimate liveaboard travelling in Indonesian waters. 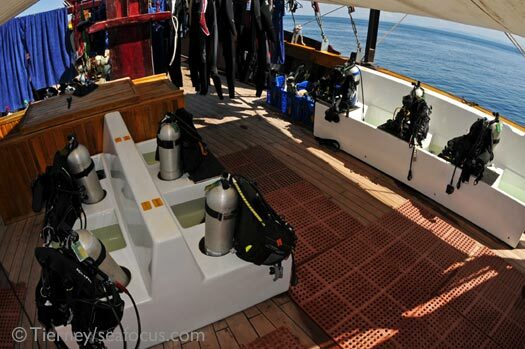 Billed as a boutique scuba diving liveaboard and described as luxurious, with the personal touch and latest technology, we found both the boat and Alberto's team more than lived up to expectations. Damai, which means peace, measures 33 metres by 8, but only has four guest cabins making each cabin around 30 square metres. All have a toilet that is separate from the shower room, and two have two double beds. Two have bath tubs as well! The calibre of the furnishings is extremely high spec. There are desks with power sockets for charging scuba toys, chairs and seating space and – thank goodness – bedside lights. All this sits beside the expected mod-cons like air conditioning. And best of all, everything works. Out in the communal spaces, there is a small but well laid out camera room, a lounge with dining table and some comfy chairs, TV, video, coffee and tea station and fridge to help yourself to drinks. On the top, there is a huge, shaded sun deck in front of the bridge, the crew cabin and a rear deck seating area for relaxing. Meals are included, of course, and are à la carte although guests are asked before each meal if they are happy with the menu. If not, the head chef whips up something to order. The calibre and variety of food was excellent and full points to the kitchen team for ensuring that our food allergy passengers and vegetarians had nothing to worry about at any time. 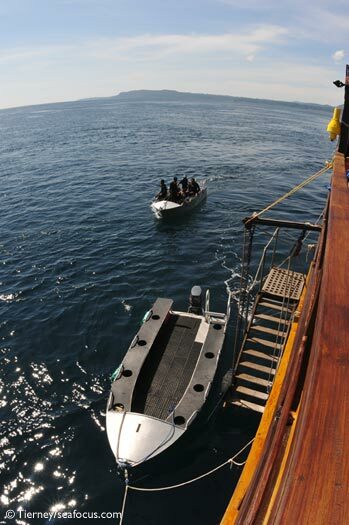 The dive deck is perhaps one of the best we have ever seen, with 10 stations for divers. Each station has a personal storage locker and a personal wash tank – no complaints from photographers about non-photographers using the camera tank on this ship – nor about those who wash out their stinky wetsuits in the communal tank. There are two aluminium dive tenders with tank recesses. These are very comfortable, easy to get back into and never feel crowded. 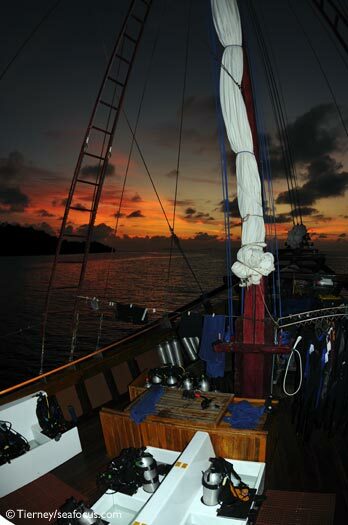 The crew are the most valuable asset on any vessel and Alberto has hired well. 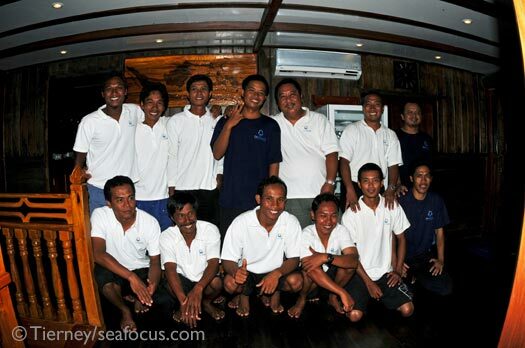 On our trip he acted as cruise director, while there were two Balinese guides, Wayan and Ketut, and Ari from Java. All three were excellent at checking conditions, researching new sites and acting as spotters. They also had good English so were fun and informative travel companions. One of Alberto's partners is another Balinese dive veteran, Gusti, who was not on our trip but we have been lucky enough to dive with him in the past. The rest of the crew took turns as boat boys, day trip guides and equipment handlers, one even turns his hand to very professional massages, yet they never let up on their real roles running the vessel to exacting standards. 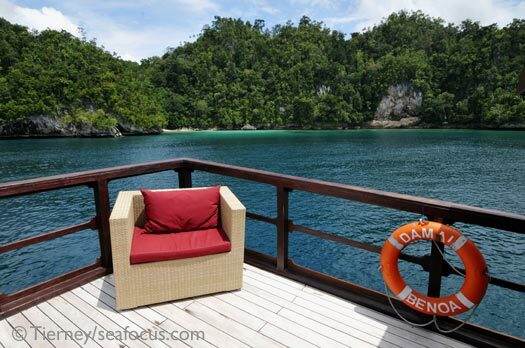 OPINION although Damai is not the cheapest diving vessel in Indonesia, she is quite probably the best value for money. These trips are all-inclusive. 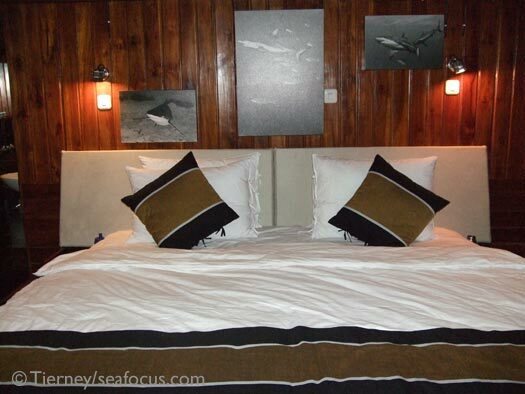 There are NO extras to pay for – port and marine park fees, fuel surcharges, drinks and wine are all included in the trip price. 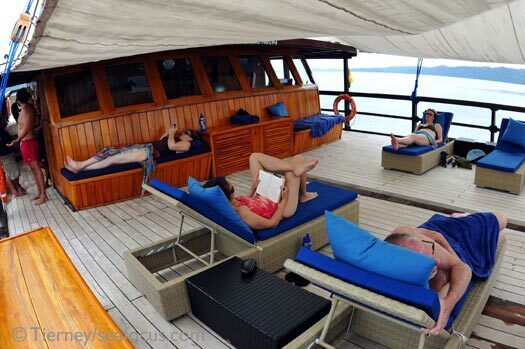 Add to that an incredible sense of space and comfort and this will rank as one of the best boats in Indonesia for quite some time.